I’ve never been very good at list-making, and I’m especially bad at picking favorites. So instead of penning another “best of 2012" column I’ve listed a dozen impressions, moments, and takeaways from plays and musicals produced in Memphis in the past year, that will stick with me for years to come. 1. 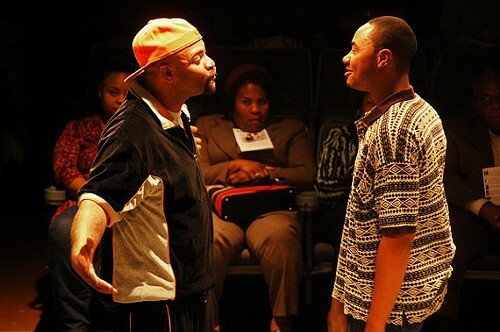 Altar Boyz, Theatre Memphis: When the boyz interacted with their audience, miracles happened. Hilarious, and accidently touching. Seldom have I seen actors thrown such a curve. And I’ve never seen a situation managed so easily, with charm and absolute confidence. 2. Bug, New Moon Theatre Company: John Dylan Atkins says, “I’m not an axe murderer,” and it becomes almost immediately clear that he’ll turn out to be something much worse. Chilling. Hitchcock, but more perverse. 3. Dangerous Liaisons at Theatre Memphis: Extraordinary lighting helped to make the transitions more compelling than the show. 4. Hurt Village at The Hattiloo: Buggy returns from a tour of Iraq and reunites with his old friend Cornbread. Two strong men embrace. It was a rare, unexpected moment of tenderness in a play where tenderness doesn’t have a chance. 5. Talley’s Folly at Theatre Memphis: Aliza Moran’s Sally Talley tells Greg Alexander’s Matt Friedman that he has to go, her opening bid in romantic negotiations as urgent and tenuous as a Cold War alliance. Beautiful duet acting from top to bottom. 6. Hot L Baltimore, Playhouse on the Square: Bussy Gower, played a freewheeling call girl with wanderlust and a head for geography calling out the names of American cities trying to guess where Nick Lerew came from. He ignored her, disappearing into his guitar picking. Out of nowhere a non-musical turned into pure jazz. 7. An Old Forest Fairy Tale, Voices of the South’s Children’s Theatre Festival: “Old ladies in tennis shoes!” And, “Old ladies with telephones.” You just had to be there. 8. Twilight of the Gods, Germantown Community Theatre: That Rasputin sure knows how to live. And die. 9. 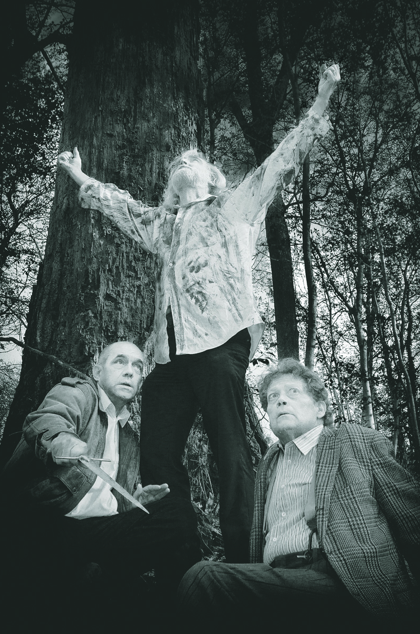 King Lear, New Moon Theatre Company: Lear has an epiphany and describes a modern condition. “Through tattered clothes small vices do appear, “Bill Baker said, allowing the King a moment of tragic lucidity. "Robes and furred gowns hide all.” Perfect. LEAR was not performed outside as the photo suggests. 10. God of Carnage, Playhouse on the Square: Erin Shelton vomits and keeps on vomiting. Cerebral gross-out humor taken as far as it could possibly go. And then a little farther. Brava! 11. Die Fledermaus, Opera Memphis: Ann Marie Hall channeled the spirit of Harpo Marx. Pure comic joy. Die Fledermaus: Silly and proud. 12. Good People at Circuit Playhouse: Samuel Beckett couldn’t have imagined anything more beautiful than Mary Buchignani sitting in hair curlers playing Bingo with Kim Justis at the end of the world. Good People was good theater. For more information on Sister Myotis's Karaoke Smackdown, click. 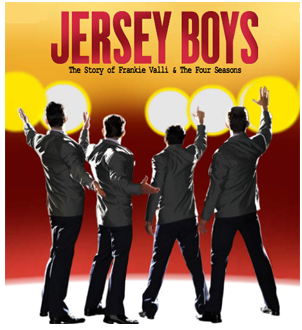 Jersey Boys, the story of Frankie Vallie and the Four Seasons, is back at the Orpheum this week. In honor of the band, their friend Joe Pesci, and their other friend the mob, here's a short list of my favorite Four Seasons tunes, with some suggestions as to how these songs might be used in some future Joe Pesci films. "Sherry," is the perfect song for a peaceful Sunday drive. Especially if Joe Pesci is at the wheel of 1963 Buick LeSabre on his way to whack a girl named Sherry. "Bye Bye Baby (Baby Goodbye)," Is best used in a scene where Joe Pesci thinks he's about to whack a girl named Sherry but gets whacked instead. 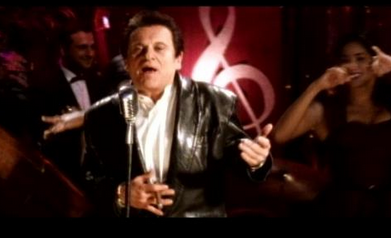 "Rag Doll," is an ideal song for any scene where Joe Pesci needs to choke somebody. "Big Girls Don't Cry": For when Joe Pesci needs to whack somebody's parents during a birthday party. "Walk Like a Man," is always appropriate. Oops, sorry. That was the Divine cover. Here's the original. If you can't get enough Jersey Boys here's a link to my interview with the cast from the show's first trip to Memphis. We ate ribs. It was nice. For tickets and times click.